limited edition design gallery in collaboration with ClassiCon – “Bell Table Ornament”. 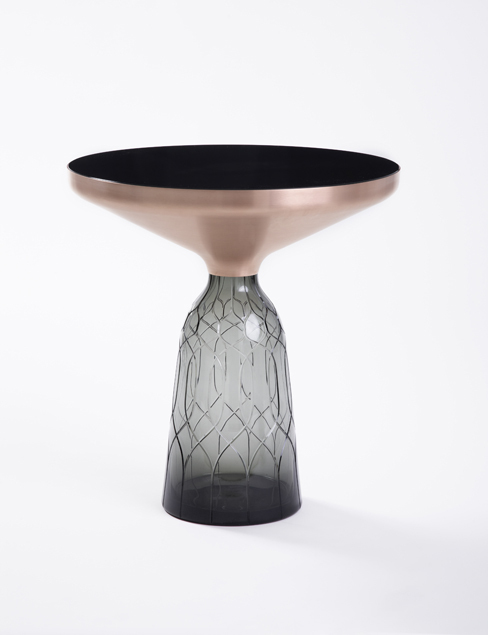 This special edition, in grey glass with copper, is limited to only 10 pieces. The transparent grey glass foot of the table, blown in a wooden mould using traditional techniques, has added an ornamental cut pattern as a special element. The metal tabletop of sleek copper seems to float over this base. The two components of the table, so different in every way, create a stunning contrast, yet combine to form an impressive whole. A glass top with black finish adds the finishing touch to this occasional table. With the elegance of its materials and colours, Herkner‘s hand-crafted “Bell Table Ornament” is a characterful addition to living areas.